Halitosis, or bad breath, can be a very big and very embarrassing problem for a lot of people. Certain foods and beverages, some dental conditions, and oral hygiene can affect your breath. Many times learning and executing the proper dental hygiene routine can be enough to combat foul smelling breath. If you continue to do the right things in terms of dental care and are still experiencing a problem, you may want to contact your doctor to see if there is not a more underlining problem. Food: The chemical breakdown of food in your mouth can give off bad odors. Garlic and onions and even curry can cause bad breath that can stay in your system for a full day. Once digested, these foods enter your bloodstream, travel into your lungs until they are expelled from your body, all the while giving off bad odors in your breath. Dental care: Not brushing and flossing daily can leave you with food particles sitting in your mouth collecting bacteria. If you are not brushing and flossing daily a layer of plaque starts to form on your teeth. 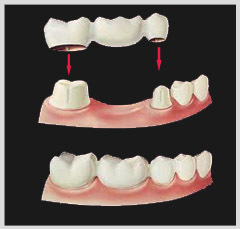 Over time plaque can irritate the gum line giving you gingivitis and ultimately tooth decay. As time goes on pockets filled with plaque start to form between the tooth and gum causing periodontitis – which will worsen your breath even further. The tongue’s uneven surface can also cause malodor by causing bacteria to get trapped. Also, failing to thoroughly clean dentures and removable bridges. Dry mouth: If you’re not producing enough saliva to aid in cleansing your mouth- you may not be washing away the particles in your mouth that can produce bad breath. Tobacco products also cause dry mouth, and to top it off smokers are more likely than others to get periodontitis, which can worsen breath. Xerostomia or dry mouth is a condition that decreases the production of saliva. Morning breath is a natural effect of dry mouth and the problem is worsened if you sleep with your mouth open. Diseases: Some diseases and certain medications can leave you with bad breath. Some cancers, diabetes, liver and kidney failure, and some metabolic disorders can cause stale, fruity, or even fishy smelling breath as a result of the chemicals they produce.